The fake letter, which was distributed as far as Black Rock and Maribyrnong. 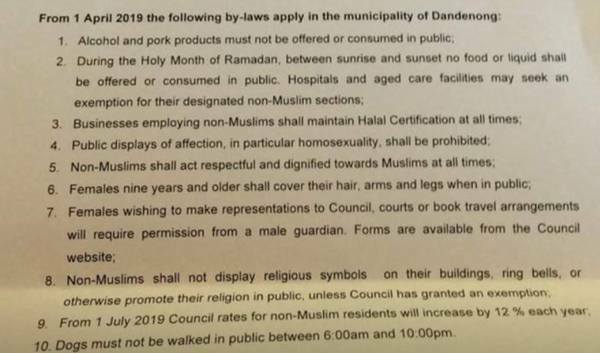 Police are investigating fake letters headed with the Greater Dandenong Council logo purporting to introduce ‘sharia’-influenced by-laws. 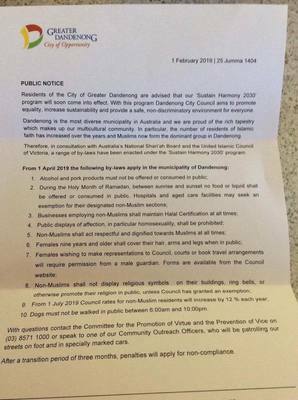 Greater Dandenong commander Mark Langhorn said the letters had been placed in residents’ letterboxes across the southern suburbs since late last week. Greater Dandenong Crime Investigation Unit detectives are investigating the case. Inspector Langhorn appealed for recipients to keep the letter in a safe place and carefully take it to a police station. Police are also seeking relevant CCTV footage. Dated 1 February or “25 Jumma 1404”, the hoax “public notice” announced a list of 10 by-laws applying from 1 April.